The Alesis ADAT digital multi-track tape recorder is an iconic piece of early 1990s audio recording equipment. ADATs used consumer S-VHS video tape to record up to 8 tracks of digital audio. They were modular, meaning that each machine could be synched with up to 15 other ADA T machines. It was therefore possible, in theory, to create a home recording studio with capacity to simultaneously record 128 tracks of audio, a process known as ‘mega-tracking’. 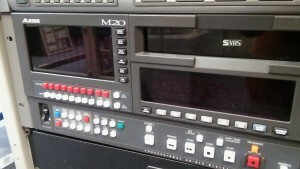 Similar to other early digital audio technology such as PCM 7030 and DAT, ADAT utilised recording methods originally developed for analogue video tape. In analogue video the use of helical scanning and rotating recording/ playback heads was the means to produce the larger bandwidth necessary to capture the analogue video signal. 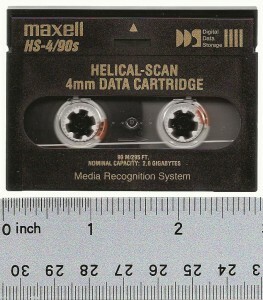 Helical scanning was logically re-purposed for recording digital audio because it similarly requires substantial bandwidth (the original ADAT recorded at a sampling rate of 48 kHz/ 16 bits). At Great Bear we receive relatively few ADAT recordings in comparison with analogue multi-track formats. This may be because ADAT is ‘recently obsolescent,’ and for everyday reasons users of this technology have not got around to migrating their archive to digital files. Like all early digital audio formats recorded on tape, however, ADAT raise specific preservation concerns. As we have stressed before, tape-based digital recordings do not degrade gracefully. They are subject to catastrophic rather than moderate signal loss. If the original recording has errors that prevent the ‘smooth’ playback of the tape (e.g., from clogged heads or the presence of dust), or there is any kind of damage to the tape surface (scratches or mould), this will create irreversible drop outs within the preservation copy. As an emergent format used by people with a range of technical expertise, it seems reasonable to expect ADAT recording practices to be a little unsettled and experimental. 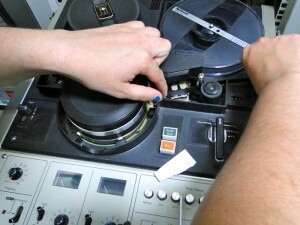 The physical strain on both tape and transport in a heavy production environment must also be considered (the shuttling back and forth of the tape mechanism), as this would have shaped the quality of the original recording. In the Great Bear studio we have several ADAT machines (the M20 and ADAT XT) ready to transfer your tapes. We deliver transferred files as individual, synchronised track ‘stems’ and use ADAT ‘sync’ and optical cables to ensure an authentic born digital workflow. The scale of digitisation jobs we do at Great Bear often varies. We are asked by our customers to reformat single items to large quantities of tape and everything else inbetween. Reformatting magnetic tape-based media always takes time and care. Transfers have to be done in real time; if you want a good quality recording there is no way to reformat tape-based media quickly. Some jobs are so big, however, that you need to find ways of speeding up the process. This is known as a parallel ingest – when you transfer a batch of tapes at the same time. Realistically, parallel ingest is not possible with all formats. An obvious issue is machine scarcity. 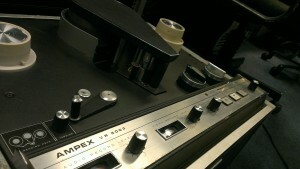 To playback tapes at the same time you need multiple playback machines that are in fairly good condition. This becomes difficult with rarer formats like early digital video tape, such as D1 or D2, where you are extremely lucky if you have two machines working at any given time. Audio cassette tapes are one of few formats where archival standard parallel ingest is possible if tapes are in good condition and the equipment is working well. We were recently approached by Jim Shields of the Zion, Sovereign Grace Baptists Church in Glasgow to do a large scale transfer of 5000 audio cassettes and over 100 open reels. Sermons were recorded using ‘semi domestic to professional cassette decks. From late Sept 1990 a TEAC X-2000 reel recorder was used [to make master copies] on 10 inch reels then transposed onto various length cassettes [when ordered by people]’ chief recordist Mike Hawkins explains. 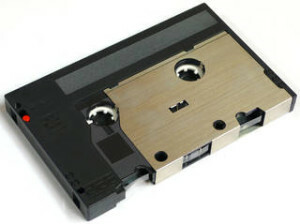 Although audio cassettes were a common consumer format it is still possible to get high quality digital transfers from them, even when transferred en masse. Recordings of speech, particularly of male voices which have a lower frequency range, are easier to manage. In order to manage a large scale job we had to increase our operational capacity. 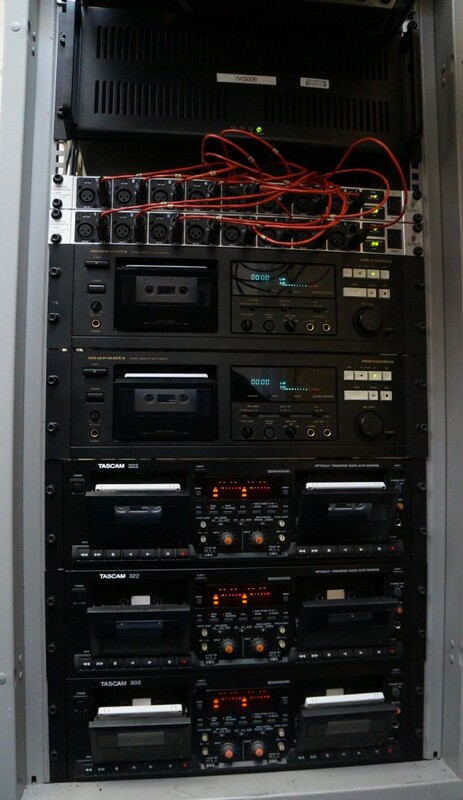 We acquired several professional quality cassette machines with auto reverse functions, such as the Marantz PMD 502 and the Tascam 322. Although these were the high end audio cassette recorders of their time, we found that important components, such as the tape transport which is ‘critical to the performance of the entire tape recorder', were in poor shape across all the models. Pitch and timing errors, or wow (low speed variations) and flutter (high speed variations), were frequently evident during test playbacks. Because of irregular machine specifications, a lot of time was spent going through all the tape decks ensuring they were working in a standardised manner. In some cases it was necessary to rebuild the tape transport using spares or even buying a new tape transport. Both of these restoration methods will become increasingly difficult in years to come as parts become more and more scarce. There are certainly good reasons to do parallel ingests if you have a large collection of tapes. Nevertheless it is important to go into large scale transfers with your eyes open. There is no quick fix and there are only so many hours in the working day to do the transfers, even if you do have eight tapes playing back simultaneously. To assess the viability of a large scale parallel ingest you may want to consider the following issues: condition of tapes, how they were originally recorded and the material stored on them. It may well be that parts of your collection can be reformatted via parallel ingest, but other elements need to be selected for more specialist attention. As ever we can help with discussing the options so do contact us if you want some specific advice. The gendered implications of this statement are briefly worth reflecting on here. Robjohns suggests that voices which command the higher frequencies, i.e., female or feminine voices, are apparently incompatible with the chemical composition of magnetic tape. If higher frequencies are retained by the top layer of magnetic tape only, but do not penetrate its full depth, does this make high frequencies more vulnerable in a preservation context because they never were never substantially captured in the first place? What does this say about how technical conditions, whose design has often been authored by people with low frequency voices (i.e., men), privilege the transmission of particular frequencies over others, at least in terms of ‘depth’? Hugh Robjohns ‘Analogue Tape Recorders: Exploration’ Sound on Sound, May 1997. Available: http://www.soundonsound.com/sos/1997_articles/may97/analysinganalogue.html. As a business situated in the heart of Bristol, Great Bear is often called upon by Bristol’s artists to re-format their magnetic tape collections. Previously we have transferred documentaries about the St. Paul’s Carnival and films from the Bristol-based Women in Moving Pictures archive. 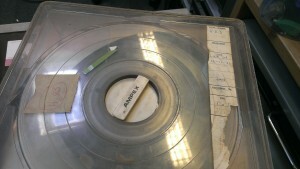 We also regularly digitise tapes for Bristol Archive Records. We were recently approached by author Phil Johnson to transfer a unique VHS recording. 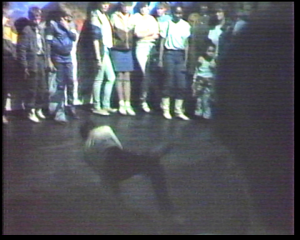 As Bristol countercultural folklore goes, the video tape is a bit of a gem: it documents the Wild Bunch performing at Arnolfini in 1985. Members went on to form Massive Attack, while Tricky and producer Nellee Hooper continue to have successful careers in the music industry. And that’s just the short-hand version of events. Want to know more? This documentary from 1996 is a good place to become acquainted. The newly transferred video will be screened at B-Boys, B-Girls, Breakdancers, Wannabees and Posers: ‘Graffiti Art in Bristol 30th Anniversary Party’, a free event taking place on Sunday 19 July 2015, 14:00 to 23:00 at Arnolfini. We are delighted to feature a guest blog from Phil Johnson, author of Straight Outta Bristol: Massive Attack, Portishead, Tricky and the Roots of Trip-Hop, who filmed the event. 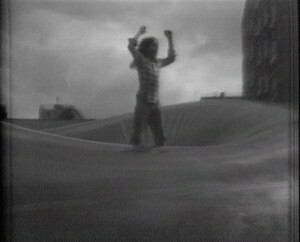 Below he beautifully evokes the social and technical stories behind why the video was made. Many thanks Phil for putting this together. In 1985 I was a lecturer in Film and Communications at Filton College with an added responsibility for running the Audio Visual Studio, a recording room and edit suite/office that had dropped from the sky as part of a new library and resources building. There was also kit of variable quality and vintage, some new, some inherited. I remember a Sony edit suite for big, chunky u-matic videos and another JVC one for VHS tapes, with a beige plasticky mixer that went in the middle by the edit controller. This also allowed you to do grandiose wipes from one camera to another, although we rarely used the camera set-up in the studio because you really needed to know what you wanted to do in advance, and no one ever did. What students liked using were the portable cameras and recorders, JVC VHS jobs that together with the fancy carry cases and padded camera boxes, plus regulation heavy pivoting tripod, weighed each prospective al fresco film-maker down with the baggage-equivalent of several large suitcases. I remember one aspiring Stanley Kubrick from Foundation Art&Design setting off to get the bus into town carrying everything himself, and returning sweatily later that day, close to collapse. He was wearing a heavy greatcoat, obviously. We had a ‘professional’ u-matic portable recorder too, and that was seriously heavy, but we didn’t have the requisite three-tube camera to get the quality it was capable of, never entirely understanding the principle of garbage in-garbage out, with the inevitable result that almost everything anyone did was doomed to remain at least as shoddy as the original dodgy signal it depended upon. But hey, this was education: it was the process we were interested in, not the product. 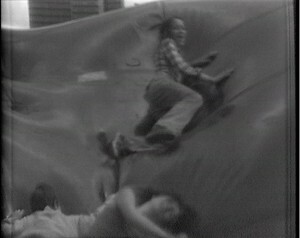 It was a JVC portable VHS recorder I was using on the night of the Wild Bunch jam at the Arnolfini on Friday 19 July 1985, the case slung over my shoulder while I held a crap Hitachi single-tube camera with a misted-over viewfinder whose murky B&W picture meant you were never entirely sure whether it was on manual or auto focus. There was no tripod, and no lighting; just me and a Foundation student, Jo Evans, helping out. The original camera tape, which I recently found after presuming it lost, is a Scotch 3M 60-minuter and the video document of the event, such as it is, lasts only until the single tape runs out, which is just about the time the Wild Bunch’s rappers, Claude and 3D, are getting started. The image quality is terrible but when there’s some light in the room – the Arnolfini’s downstairs gallery – you can just about make out what’s happening. When it’s dark – and it generally is – the image is so thin it’s barely an image at all. As this is the camera tape – unimportant in itself, and usually only considered as the raw material for a later edit – the significance of what is shown is very provisional. What I meant to focus on, and what was only being picked up because it was easier to keep recording than it was to switch to ‘pause’, is impossible to say. But what the tape does show – when, of course, there’s enough information there to make out anything at all – is now the stuff of history: a Mitchell and Kenyon type document of the yet-to-emerge ‘Bristol Sound’, and a weirdly innocent time that existed before the camera phone. And there it all is: graffiti on the walls, funk, electro and rap on the muffled boominess of the mono soundtrack, with dancers breaking acrobatically on the floor as rockabilly quiffed boys, big-haired girls and lots and lots of very young kiddies look on. 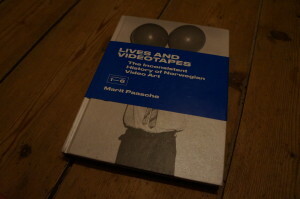 As to why I filmed the event in the first place: it was partly for my master’s dissertation (Black Music, the Arts and Education’ – classic lefty teacher getting down with the kids) and partly for the Arnolfini’s new video library. If you go down and see it on Sunday July 19: enjoy. We recently received a fascinating collection of tapes from the archive of Robert Chenciner, an ethnographer with over thirty years experience studying the cultures, human rights and current affairs of Daghestan. Daghestan is located in the north Caucasus region, its neighbouring countries are Azerbaijan, Chechnya and Georgia, while its eastern border is flanked by the Caspian Sea. In the early 1980s Robert had unique access to Daghestan and other parts of the Soviet Caucasus in the twilight years of the USSR. During visits Robert made recordings of Daghestan’s rich culture. This included music, documenting ethnic instruments such as the Chagana, as well as singing and dancing. Although Robert believes that claims to authenticity must be treated with suspicion, he nonetheless told me that these recordings document the traditional folk culture that was practiced in the villages of Daghestan. These tapes also document the 31 mutually unintelligible languages spoken in Daghestan such as Avar which is spoken by 900,000 people. When Robert travelled to Daghestan he was keen to get the most professional recordings he could. 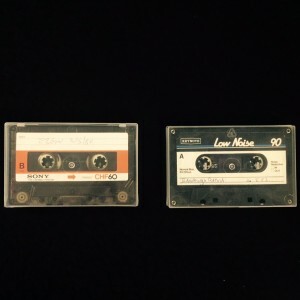 For this reason he used type VI metal audio cassette tapes, a tape formula that had been introduced in the late 1970s to offer better quality recordings. Since completing the recordings in the mid 1980s, as with so many of the tapes we receive at Great Bear, they have been tucked away in a drawer and out of circulation. 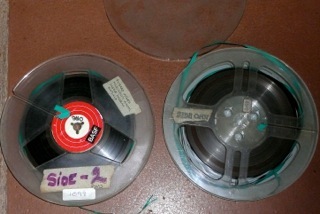 Due to being stored in poor conditions some of the tapes were displaying signs of mould growth. Another problem some tapes exhibited was the degradation of the foam pressure pad. This had ‘stuck’ onto the tape and stopped it it from playing. 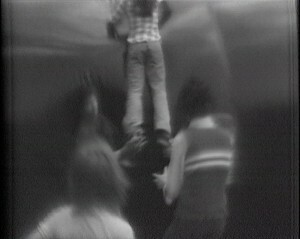 In one case the tape had snapped as a result from a previous attempt at playback. 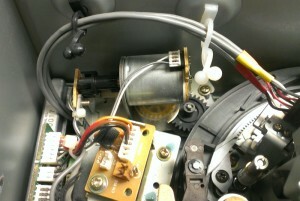 The insides of a Nakamichi machine that has no need of a pressure pad to play back tapes. 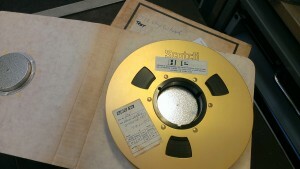 Recent interest from musicologist Stefan Williamson-Fa, the driving force behind getting the tapes transferred to digital files with Great Bear, will enable these unique recordings to be heard by new audiences. These include what Robert believes to be the only recording of an Andi Zikr ritual. Banned by the Tsar and later the Soviets, the Zikr ritual proved to be a resilient part of Daghestan’s Sufi culture. Zikr involves a group rotating in a circle, stamping the ground and grunting in order to create a mystical and ecstatic experience. Stefan and Robert have plans to make the transferred digital files available online. 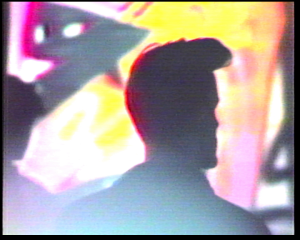 Robert reflected that when he was collecting the tapes in the 1980s his imagined audience for the recordings was pretty small. With the possibility of online publication this audience has substantially increased. Furthermore, through people uploading material to sites such as YouTube the amount of Daghestan’s culture that can be accessed on the internet continues to grow. Robert’s links with the academic community in Daghestan also means the recordings will gain exposure there as well. It is no doubt that those interested in the cultural history of Daghestan will await the publication of these recordings with much excitement. When the website is available we will of course let you know! While this statement is true in general for many different multi-format collections, the issue of compromise and conflicting parameters becomes especially apparent with the preservation of digitized and born-digital video. The reasons for this are complex, and we shall outline why below. We have written in depth on this blog about the labour intensity of digital information management in relation to reformatting and migration processes (which are of course Great Bear’s bread and butter). We have also discussed how the lack of settled standards tends to make preservation decisions radically provisional. In contrast, we have written about default standards that have emerged over time through common use and wide adoption, highlighting how parsimonious, non-interventionist approaches may be more practical in the long term. What then, is this ‘mixing and matching’ all about? It refers to all the possible combinations of bitsteam encodings (‘codecs’) and ‘wrappers’ that are available as target formats for digital video files. Want to mix your JPEG2000 – Lossless with your MXF, or ffv1 with your AVI? Well, go ahead! What then is the difference between a codec and wrapper?. The wrapper or ‘file envelope’ stores key information about the technical life or structural properties of the digital object. Such information is essential for long term preservation because it helps to identify, contextualize and outline the significant properties of the digital object. Audio Rendering – Bit depth and Sample Rate, Bit Rate and compression codec, type of uncompressed sampling. Codecs, on the other hand, define the parameters of the captured video signal. They are a ‘set of rules which defines how the data is encoded and packaged,’  encompassing Width, Height and Bit-depth, Colour Model within a given Colour Space, Pixel Aspect Ratio and Frame Rate; the bit depth and sample rate and bit rate of the audio. Although the wrapper is distinct from the encoded file, the encoded file cannot be read without its wrapper. The digital video file, then, comprises of wrapper and at least one codec, often two, to account for audio and images, as this illustration from AV Preserve makes clear. Why then, are there so many possible combinations of wrappers and codecs for video files, and why has a settled standard not been agreed upon? Fleischhauer at The Signal does an excellent job outlining the different preferences within practitioner communities, in particular relating to the adoption of ‘open’ and commercial/ proprietary formats. One answer to the question: why so many different formats can be explained by different approaches to information management in this information-driven economy. The combination of competition and innovation results in a proliferation of open source and their proprietary doubles (or triplets, quadruples, etc) that are constantly evolving in response to market ‘demand’. An important area to highlight driving change in this area is the role of the broadcast industry. Format selections in this sector have a profound impact on the creation of digital video files that will later become digital archive objects. In the world of video, Kummer et al explain in an article in the IASA journal, ‘a codec’s suitability for use in production often dictates the chosen archive format, especially for public broadcasting companies who, by their very nature, focus on the level of productivity of the archive.’  Broadcast production companies create content that needs to be able to be retrieved, often in targeted segments, with ease and accuracy. They approach the creation of digital video objects differently to how an archivist would, who would be concerned with maintaining file integrity rather ensuring the source material’s productivity. Take, for example, H.264/ AVC ‘by far the most ubiquitous video coding standard to date. It will remain so probably until 2015 when volume production and infrastructure changes enable a major shift to H.265/ HEVC […] H.264/ AVC has played a key role in enabling internet video, mobile services, OTT services, IPTV and HDTV. H.264/ AVC is a mandatory format for Blu-ray players and is used by most internet streaming sites including Vimeo, youtube and iTunes. It is also used in Adobe Flash Player and Microsoft Silverlight and it has also been adopted for HDTV cable, satellite, and terrestrial broadcasting,’ writes David Bull in his book Communicating Pictures. The explosion of mobile, video data in the current media moment is one of the main reasons why sophisticated compression codecs are being developed. This should not pose any particular problems for the audiovisual archivist per se—if a file is ‘born’ with high degrees of compression the authenticity of the file should not ideally, be compromised in subsequent migrations. Nevertheless, the influence of the broadcast industry tells us a lot about the types of files that will be entering the archive in the next 10-20 years. On a perceptual level, we might note an endearing irony: the rise of super HD and ultra HD goes hand in hand with increased compression applied to the captured signal. While compression cannot, necessarily, be understood as a simple ‘taking away’ of data, its increased use in ubiquitous media environments underlines how the perception of high definition is engineered in very specific ways, and this engineering does not automatically correlate with capturing more, or better quality, data. 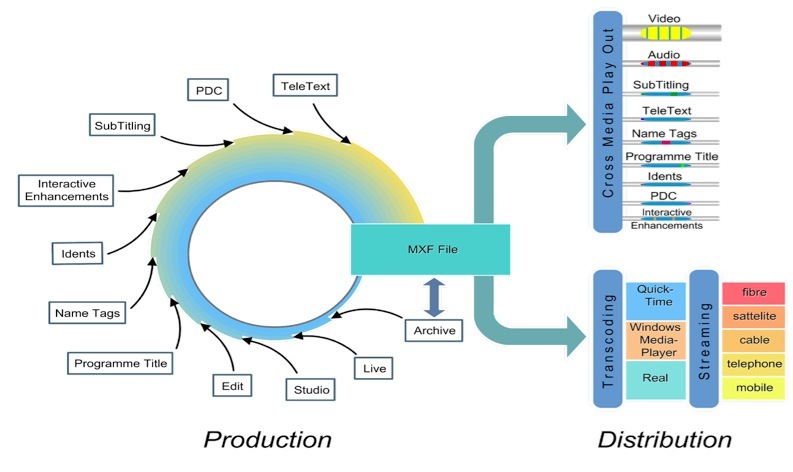 We can see such adoption in action with the Digital Production Partnership’s AS-11 standard, which came into operation October 2014 to streamline digital file-based workflows in the UK broadcast industry. The world of archiving and reformatting digital video is undoubtedly complex. As the quote used at the beginning of the article states, any decision can only ever be a compromise that takes into account organizational capacities and available resources. What is positive is the amount of research openly available that can empower people with the basics, or help them to delve into the technical depths of codecs and wrappers if so desired. We hope this article will give you access to many of the interesting resources available and some key issues. As ever, if you have a video digitization project you need to discuss, contact us—we are happy to help! IASA Technical Committee (2014) Handling and Storage of Audio and Video Carriers, 6. Carl Fleischhauer, ‘Comparing Formats for Video Digitization.’ http://blogs.loc.gov/digitalpreservation/2014/12/comparing-formats-for-video-digitization/. Federal Agencies Digital Guidelines Initiative (FADGI), Digital File Formats for Videotape Reformatting Part 5. Narrative and Summary Tables. http://www.digitizationguidelines.gov/guidelines/FADGI_VideoReFormatCompare_pt5_20141202.pdf, 4. FADGI, Digital File Formats for Videotape, 4. AV Preserve (2010) A Primer on Codecs for Moving Image and Sound Archives & 10 Recommendations for Codec Selection and Management, www.avpreserve.com/wp-content/…/04/AVPS_Codec_Primer.pdf, 1. 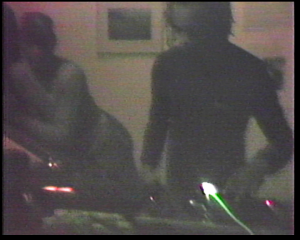 ‎ FADGI (2014) Creating and Archiving Born Digital Video Part III. High Level Recommended Practices, http://www.digitizationguidelines.gov/guidelines/FADGI_BDV_p3_20141202.pdf, 24. Jean-Christophe Kummer, Peter Kuhnle and Sebastian Gabler (2015) ‘Broadcast Archives: Between Productivity and Preservation’, IASA Journal, vol 44, 35. Kummer et al, ‘Broadcast Archives: Between Productivity and Preservation,’ 38. David Bull (2014) Communicating Pictures, Academic Press, 435-437. Av Preserve, A Primer on Codecs for Moving Image and Sound Archives, 2. For more reflections on compression, check out this fascinating talk from software theorist Alexander Galloway. The more practically bent can download and play with VISTRA, a video compression demonstrator developed at the University of Bristol ‘which provides an interactive overview of the some of the key principles of image and video compression. ‘FADGI, Digital File Formats for Videotape, 11. Presto Centre, AV Digitisation and Digital Preservation TechWatch Report #3, https://www.prestocentre.org/, 9. Presto Centre, AV Digitisation and Digital Preservation TechWatch Report #3, 10-11. There are an astonishing amount of online resources relating to the preservation and re-formatting of magnetic tape collections. Whether you need help identifying and assessing your collection, getting to grips with the latest video codec saga or trying to uncover esoteric technical information relating to particular formats, the internet turns up trumps 95% of the time. Marvel at the people who put together the U-Matic web resource, for example, which has been online since 1999, a comprehensive outline of the different models in the U-Matic ‘family.’ The site also hosts ‘chat pages’ relating to Betamax, Betacam, U-Matic and V2000, which are still very much active, with archives dating back to 1999. For video tape nerds willing to trawl the depths of these forums, nuggets of machine maintenance wisdom await you. Sometimes you need to turn to rigorous, peer-reviewed research in order to learn from AV archive specialists. Fortunately such material exists, and a good amount of it is collected and published by the International Association of Sound and Audiovisual Archives (IASA). ‘Established in 1969 in Amsterdam to function as a medium for international co-operation between archives that preserve recorded sound and audiovisual documents’, IASA holds expertise relating to the many different and specialist issues attached to the care of AV archives. Comprised of several committees dealing with issues such as standards and best practices; National Archive policies; Broadcast archives; Technical Issues; Research Archives; Training and Education, IASA reflects the diverse communities of practice involved in this professional field. 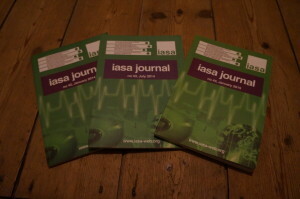 As well as hosting a yearly international conference (check out this post on The Signal for a review of the 2014 meeting), IASA publish a bi-annual journal and many in-depth specialist reports. Their Guidelines on the Production and Preservation of Digital Audio Objects (2nd edition, 2009), written by the IASA Technical Committee, is available as a web resource, and provides advice on key issues such as small scale approaches to digital storage systems, metadata and signal extraction from original carriers, to name a few. Most of the key IASA publications are accessible to members only, and therefore remain behind a paywall. It is definitely worth taking the plunge though, because there are comparably few specialist resources relating to AV archives written with an interdisciplinary—and international—audience in mind. Examples of issues covered in member-only publications include Selection in Sound Archives, Decay of Polymers, Deterioration of Polymers and Ethical Principles for Sound and Audiovisual Archives. The latest publication from the IASA Technical Committee, Handling and Storage of Audio and Video Carriers (2014) or TC05, provides detailed outlines of types of recording carriers, physical and chemical stability, environmental factors and ‘passive preservation,’ storage facilities and disaster planning. ‘TC 05 is not a catalogue of mere Dos and Don’ts. Optimal preservation measures are always a compromise between many, often conflicting parameters, superimposed by the individual situation of a collection in terms of climatic conditions, the available premises, personnel, and the financial situation. No meaningful advice can be given for all possible situations. TC 05 explains the principal problems and provides a basis for the archivist to take a responsible decision in accordance with a specific situation […] A general “Code of Practice” […] would hardly fit the diversity of structures, contents, tasks, environmental and financial circumstances of collections’ (6). Being an IASA member gives Great Bear access to research and practitioner communities that enable us to understand, and respond to, the different needs of our customers. Typically we work with a range of people such as individuals whose collections have complex preservation needs, large institutions, small-to-medium sized archives or those working in the broadcast industry. Our main concern is reformatting the tapes you send us, and delivering high quality digital files that are appropriate for your plans to manage and re-use the data in the future. If you have a collection that needs to be reformatted to digital files, do contact us to discuss how we can help. 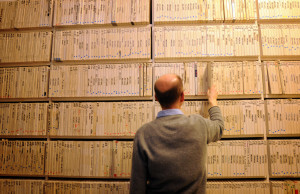 Deciding when to digitise your magnetic tape collections can be daunting. They chart the different stages of ‘uncertainty,’ ‘awakening’, ‘enlightenment’, ‘wisdom’ and ‘certainty’ that organisations move through as they appraise their collections and decide when to re-format to digital files. For small to medium size archives, digitising collections may provoke worries about a lack of specialist support or technical infrastructure. It may be felt that resources could be better used elsewhere in the organisation. Yet as we, and many other people working with audiovisual archives often stress, the decision to transfer material stored on magnetic tape has to be made sooner or later. With smaller archives, where funding is limited, the question of ‘later’ is not really a practical option. 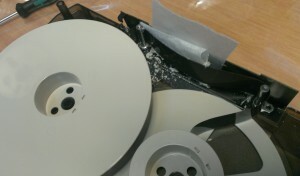 Furthermore, the financial cost of re-formatting audiovisual archives is likely to increase significantly in the next five-ten years; machine obsolescence will become an aggravated problem and it is likely to take longer to restore tapes prior to transfer if the condition of carriers has dramatically deteriorated. The question has to be asked: can you afford not to take action now? If this describes your situation, you might want to hear about other small to medium sized archives facing similar problems. We asked one of our customers who recently sent in a comparatively small collection of magnetic tapes to share their experience of deciding to take the digital plunge. We are extremely grateful for Annaig from the Medical Mission Sisters for answering the questions below. We hope that it will be useful for other archives with similar issues. 1. First off, please tell us a little bit about the Medical Mission Sisters Archive, what kind of materials are in the collection? The Medical Mission Sisters General Archives include the central archives of the congregation. They gather all the documents relating to the foundation and history of the congregation and also documents relating to the life of the foundress, Anna Dengel. The documents are mainly paper but there is a good collection of photographs, slides, films and audio documents. Some born digital documents are starting to enter the archives but they are still few. The main reason was accessibility. The documents on video tapes or audio tapes were the only usable ones because we still had machines to read them but all the older ones, or those with specific formats, where lost to the archives as there was no way to read them and know what was really on the tapes. Plus the Medical Mission Sisters is a congregation where Sisters are spread out on 5 continents and most of the time readers don’t come to the archives but send me queries by emails where I have to respond with scanned documents or digital files. Plus it was obvious that some of the tapes were degrading as that we’d better have the digitisation sooner than later if we wanted to still be able to read what was on them. Space and preservation was another issue. With a small collection but varied in formats, I had no resources to properly preserve every tape and some of the older formats had huge boxes and were consuming a lot of space on the shelves. Now, we have a reasonably sized collection of CDs and DVDs, which is easy to store in good conditions and is accessible everywhere as we can read them on computer here and I can send them to readers via email. 3. Digital preservation is a notoriously complex, and rapidly evolving field. As a small archive, how do you plan to manage your digital assets in the long term? What kinds of support, services and systems are your drawing on to design a system which is robust and resilient? At the moment the digital collection is so small that it cannot justify any support service or system. So I have to build up my own home made system. I am using the archives management software (CALM) to enter data relating to the conservation of the CDs or DVDs, dates of creation, dates to check them and I plan to have regular checks on them and migrations or copies made when it will prove necessary. 4. Aside from the preservation issue, what are your plans to use the digitised material that Great Bear recently transferred? It all depends on the content of the tapes. But I’ve already spotted a few documents of interest, and I haven’t been through everything yet. My main concern now is to make the documents known and used for their content. I was already able to deliver a file to one of the Sisters who was working on a person related to the foundation of the congregation, the most important document on her was an audio file that I had just received from Great Bear, I was able to send it to her. The document would have been unusable a few weeks before. I’ve come across small treasures, like a film, probably made by the foundress herself, which nobody was aware of. The Sisters are celebrating this year the 90th anniversary of their foundation. I plan to use as many audio or video documents as I can to support the events the archives are going to be involved into. What is illuminating about Annaig’s answers is that her archive has no high tech plan in place to manage the collection – her solutions for managing the material very much draw on non-digital information management practices. The main issues driving the decision to migrate the materials are fairly common to all archives: limited storage space and accessibility for the user-community. What lesson can be learnt from this? Largely, that if you are trained as an archivist, you are likely to already have the skills you need to manage your digital collection. So don’t let the more bewildering aspects of digital preservation put you off. But do take note of the changing conditions for playing back and accessing material stored on magnetic tape. There will come a time when it will be too costly to preserve recordings on a wide variety of formats – many of such formats we can help you with today. If you want to discuss how Great Bear can help you re-format your audiovisual collections, get in touch and we can explore the options. If you are a small-medium size archive and want to share your experiences of deciding to digitise, please do so in the comment box below.